Choosing a bed for our dogs is not always easy. While we see a soft and squishy bed as a cozy place for our dogs to sleep, they often see it as the perfect chew toy. A good dog bed is not cheap, so having it pulled to bits is frustrating as well as expensive. What’s more, for some dogs a chewed dog bed can prove dangerous. While some dogs only chew foreign objects, others will ingest the material. Not only does this present a possible choking hazard but it can also lead to intestinal blockages and a hefty vet bill. Although chewing is a natural behavior for our dogs, other factors may increase the likelihood that your dog will chew, such as pain, boredom, teething, and anxiety to name a few. So how do we provide a comfortable and safe place for our dogs to sleep? Fortunately, there are lots of dog beds on the market especially for dogs that chew. We really like the Kuranda dog bed for its superior durability, but for more options, read on. It’s a big claim to call any dog bed chew proof or indestructible. Whether a dog bed is genuinely durable depends on many factors, not least your dog’s determination. However, it’s always useful to think about why your dog might be chewing something they shouldn’t. Dealing with the cause can save time, distress and money in the long term. Puppies teeth between three and seven months of age. The discomfort that they experience as they go through the process of getting their adult teeth gives them an uncontrollable urge to chew. Not only does the action of chewing relieve some of the pain but it also helps loosen and remove the puppy teeth. Dogs are social and need regular interaction to keep them happy. Dogs learn very quickly that chewing or stealing something they shouldn’t result in a game of chase or some form of attention from their owner. Never underestimate the need for both physical and mental stimulation. Many dogs chew to relieve boredom when left alone. While some dogs tolerate boredom by sleeping, others will turn to destructive behaviors to relieve the monotony. Many dogs suffer from separation anxiety and chew to relieve their distress. Often stress chewers choose items that smell strongly of their owners, like shoes for example. While we explore objects with our hands, our dogs do so with their teeth. New items often get more attention than familiar ones, and de-stuffing is enjoyable for many dogs. Before you invest in a new bed, consider the above and any improvements you can make to your dog’s routine to reduce their desire to chew. Exercise your dog. Taking your dog out twice a day provides both physical and mental exercise. Dogs that are allowed to sniff and explore are more likely to be relaxed and tired when they get home. Provide appropriate toys and chews for your dog. While it’s advisable to supervise your dog as they chew, giving them safe items to gnaw on will help minimize destructive chewing. Remove items that your dog finds tempting. This includes shoes, remote controls and anything that your dog can easily find or smells strongly of you. Play with your dog. Playing engages both your dog’s brain and body and can prevent boredom even when the play sessions are short. Whenever you see your dog chew something they shouldn’t always offer an appropriate chew or toy in its place. Praise them for chewing on the correct object and if possible remove the other object from sight. Designed to be durable chew proof dog beds are often made of a chew-resistant material or have metal frames. While they don’t look like the coziest of resting places, if your priority is to keep your dog from chewing they are a good option. The harder the bed is to chew or de-stuff the less likely it is that your dog will persist in attempting to gnaw on it. The idea being that your dog will eventually get tired of trying and sleep on it instead of chewing it. We’ve picked the best indestructible dog beds, but you know your dog best. 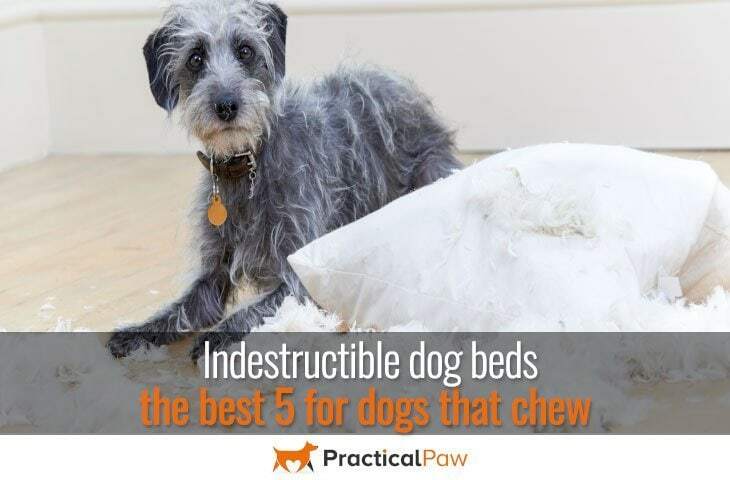 Choose the bed that your dog is least likely to chew. Kuranda’s beds come in a variety of frame materials. This model has chewers in mind as the frame is aluminum. Not only is this dog bed chew proof, but its heavy-duty construction makes it suitable for even the largest dog. The aircraft grade aluminum frame makes it extremely strong yet lightweight. What’s more, the ingenious design hides the fabric edges, discouraging chewing. The sleeping area is solid vinyl making it very easy to clean. Not only that but the material, which is available in four color options goes all the way into the corners, so there are no tempting edges for your dog to nibble. The fabric, while supportive doesn’t have much give. HuggleHounds make durable products for tough chewers, and this bed is no exception. The Tuffut Luxx bed has a four-layer construction and claims to be over twice as strong as other materials. Not only is the material tear and abrasion resistant but it’s also stronger in tensile strength. Made with a quilted rip-stop nylon cover that is removable for easy cleaning, this is a comfortable yet durable option. Available in three sizes and three colors, HuggleHounds are so confident that their beds will withstand your dogs gnawing that they offer a one-time cover replacement with proof of purchase. Waterproof as well as chew-proof. It can be especially difficult to get a bed that is tough but provides a den-like sleeping environment. So, we’ve included this option from K9 Ballistics, that offers durability as well as being cozy for dogs that like to curl up when they sleep. Made from a robust propriety blend of 1680 Denier rip stop ballistic Nylon the bed resists tearing and scratching. The high bolster walls keep dogs cozy, and there’s a removable pad for easy cleaning. Not only that but if the bed gets dirty, you can stick the whole thing in a washing machine. If your dog likes to rip soft bedding, then this tough plastic bed option is a great alternative. Suitable for indoor or outside use. This bed has ventilation holes in the bottom to keep it nice and fresh. The bed can be hosed down which makes it simple to clean. While it doesn’t look very soft or cozy, adding blankets make it a comfortable place for your dog to snooze. MADE WITH A BREATHABLE, EXTREMELY DURABLE PVC COATED HIGH STRENGTH POLYESTER YARN MESH. FINALLY a dog bed that can handle your dogs claws! FRAME IS MADE FROM RECTANGULAR STEEL TUBING to make for a very stable and VERY DURABLE raised bed. Fiksu Pets is a USA company that WILL make sure you are satisfied with your product as well as your experience. We’ve chosen another elevated option, this time from Fiksu. Strong steel tubing makes up the frame, while the PVC coated Polyester provides a durable sleeping area. Not only is the bed strong but it’s also resistant to tears. Which makes it less appealing to chewing dogs. Fur, dust and dander brushes off so it’s simple to keep clean. What’s more, it’s easy to spot clean with warm soapy water. It’s available in two sizes and can support dogs up to one hundred pounds. Chewing is an entirely natural behavior of our dogs, and they spend a lot of time in their beds. Finding a durable and comfortable place for them to sleep is not always easy. We really like the Kuranda dog bed for overall durability. However if your dog continues to chew it’s worth looking for an underlying issue that triggers the behavior.